TSMS 6th,7th, 8th, 9th,10th Classes Admission Test Results 2018 @ telanganams.cgg.gov.in, Telangana Model School Results, Telangana Model School Entrance Exam Results 2018 for 6th, 7th, 8th, 9th, 10th Classes will be released on May 16th, 2018. Check TSMS Admission test Results 2018 from the official website telanganams.cgg.gov.in. Telangana Model School Entrance Exam for 6th 10th classed are conducted on 15th April 2018. Candidates who are written exam can check TS Model School Results class wise, students can also check and download selected list or merit list from here. TSMSCET 2018/ TSMS 7th to 10th classes Admission Test 2018 notification has been released by the DSE and Ex-officio PD, Model Schools Telangana in January, 2018 for admission into Model Schools in the Telangan State and online applications were invited from the eligible students, those who were passed VI, VII, VIII and IX classes students were applied for VI, VII, VIII,IX and X classes(Vacant Seats) into Model Schools. These admissions made into English medium. Each class will be having a sanctioned strength of 100 students. These institutions are co-educational and follow state syllabus with Telugu as first language up to class X.
TS RMSA, Hyderabad invited online applications from the eligible students through telanganams.cgg.gov.on webportal from 23-01-2018 to 28-02-2018. TSMS entrance exams was conducted on 15-04-2018 at each mandal head quarters/model schools in all districts of T State and exam held from 10.00 AM to 12.00 noon and 2 to 4 pm as per its schedule. 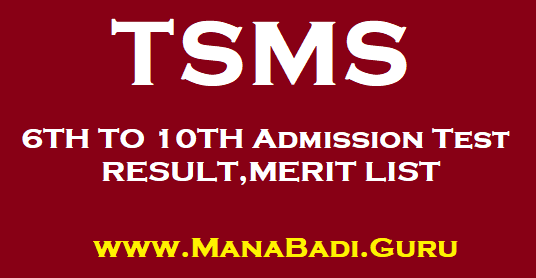 TSMS 6th/7th/8th/9th/10th classes admission test Results, Merit list 2018. #Take the copy and Download.